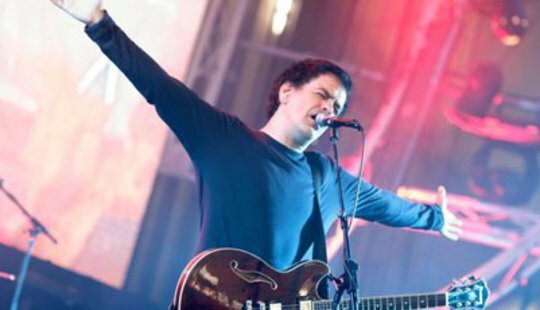 Because of the upcoming spanish tour of The Wedding Present, we are pleased to publish this interview with their leader, David Gedge, offered a few days before the concert in Granada, next October 18 in Planta Baja. New album, Valentina (2012), and touring Spain again. Congratulations. Awesome news for a fan like me. The Spanish connection. During the last 20 years there have been some collaborations with different Spanish labels such as Siesta or Houston Party, as long as, frequent concerts in our country, most of all since the release of your last album El Rey (2008). 1. Which may be the secret of this long- lasting relationship? The Wedding Present have always tried to maintain a strong relationship with our friends in Spain. The reason is simple... we like to visit, the people are welcoming, we like the food, we like the wine, the weather... but also I think that Spain has a strong tradition of ‘alternative pop music’ that other countries don’t always have. New Stuff Vs. Old Stuff. As it happened in other concerts in our country, focussed on the anniversary of some of your most significant albums; in 2010, we had the opportunity to enjoy with the anniversary of Bizarro, just in the same club (Planta Baja) where your next concert will take place next Thrursday. 2. Do you prefer presenting new stuff or, on the other hand, recreating old hits? 3. Regarding “anniversary concerts”. Are they a real celebration, something imposed by market forces or better an excuse to keep touring taking into account the dificult time for music? 4. Do you think this fomula may reduce your group career to a just nostagic cliché or, on the contrary, they may be a good way of showing old stuff to potential fans? Since our concerts are usually 80-90 minutes long, we can easily play a 45-minute album as part of the set. So, instead of just playing a selection of old songs randomly sprinkled into the show, if we play an entire collection in the way we have been doing this year with Seamonsters, we are actually presenting a set of songs from a certain period in the way they were meant to be heard. It’s like a little mini-set within the set and I think it works very well. The Industry. Clearly, The Wedding Present is a band known for not making concessions to the music industry: several label changes. 5. Is it a good way to mantain the creative independence or “these things happen”? Regarding not making concessions to the music industry... I just feel that as an artist I don’t want decisions to be made on my behalf by businesspeople. If we have to make any commercial compromises it must be the band alone that makes that decision. But that isn’t the reason why we have recorded for several labels... most of the people we have worked with have understood our principles and accepted that. What happens is that people at labels come and go and when these changes happen, some bands come, some bands go... so, yes, it’s because, as you say “these things happen”! Ha, ha... that’s a nice description! 6. Are your songs “sketches from life”? Totally. I sometimes feel like a bit of a fraud. People tell me that they love my lyrics but all I essentially do is observe what’s going on around me. I absorb these little stories and then regurgitate them in the form of a song! 7. Do you usually follow a method for writing or is there an specific way of writing for each song? No, each song is different. But I’m kind-of obsessed with doing it, so I’m thinking about different scenarios all the time. All my ideas go into my little book and I use that whenever we have some music to work with. Throughout more than 25 years, there have been many different members in the band being you the only stable one. 8. Do you go through all these changes like sad endings or new begginings? Both, ha, ha! It’s always sad when people leave because obviously when you are working with someone in such a close environment you establish a strong relationship with them. Having said that, when a new person enters the band they bring with them new ideas and new enthusiasm and the group goes through a little ‘re-birth’. Now, you are living in California. 9. Has it got any repercussion to your songs, to your way of working? Not really. I mean, there were a few small references to L.A. on El Rey but it wasn’t a concept album or anything! I think the words and music of The Wedding Present are pretty ‘universal’, to be honest. Valentina. A new album after four years. 10. What does Valentina mean in your career? Valentina is the sound of The Wedding Present in 2012. There’s obviously a link to The Wedding Present of previous years but, at the same time, it has its own distinct personality. 11. Which are the basic differences with regards to your previous album, El Rey? I think El Rey was more of a ‘pop record,’ which is odd since we had Steve Albini record it! But I think the current line-up has a rockier feel. Also, Graeme Ramsay, the guitarist on Valentina, used to be the Wedding Present drummer and I think that influenced much of the writing. There are some interesting rhythms and I think it’s less ‘straight-forward’ than El Rey. 12. Could you briefly describe the process of the album composition and recording? Usually I, or another band-member, will come up with an idea for a melody and then the band will arrange it together. When we have decided that it sounds like the basis for a song I will lock myself away and think about lyrics. Then, it’s back to the rehearsal room for the final arrangements and to work out how the recording should sound. How fast should we play it? Should we use extra instruments? And then we go to the recording studio, where, as I mentioned, we tend to record pretty much ‘live’ anyway. Finally, the recordings are mixed. For Valentina we used a renowned mixing engineer called Andrew Scheps. 13. Do you think that the last album is always the best one? I can’t really choose a favourite between them. All I can say is that our first album was not the best! 14. 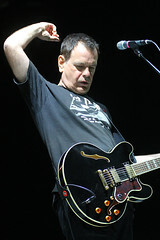 Can you give us a good reason to attend The Wedding Present gigs in 2012? Because we will have dancing girls, magic tricks and performing poodles! Long time fans tell me that it has been an fascinating experience to see The Wedding Present develop and evolve over the years and so I think people will be interested to see the ‘new’ version. Thanks a lot for your time. Good luck! Thank you... all the best!